While I’m an equal opportunity sangria (and wine for that matter) drinker, I know there are many of you out there who just really do not like red wine and therefore stay away from red sangria. 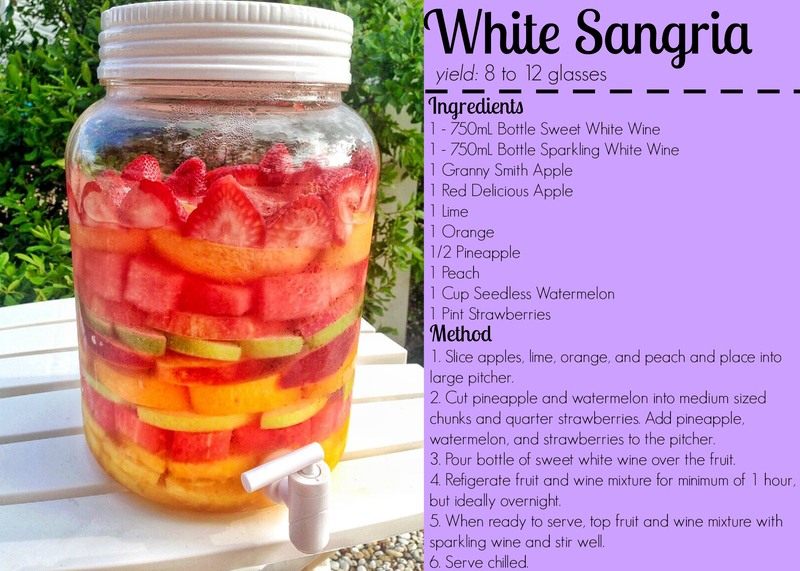 While a little less common than it’s red cousin, white sangria is equally delicious and easy to make! I start out with a LOT of fruit. Be sure to pick fruits that you like to eat because they will be providing most of the sangria’s flavor. Some of my favorites are pineapple, strawberries, apples, limes, and oranges, but in the summertime it’s great to use fruit like watermelon and peaches to add a little something extra! 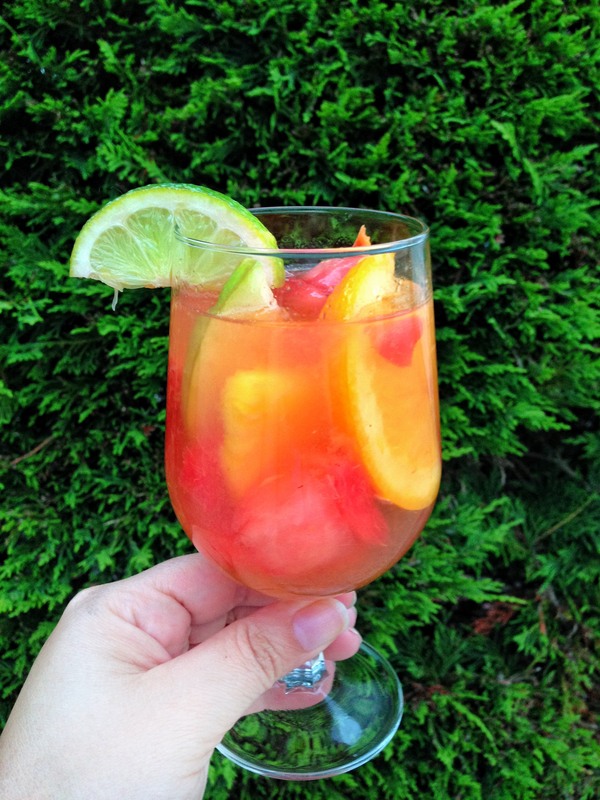 The fun thing about White Sangria is that you can really see the fruit. If you’re having a party you may want to build your sangria in a drink dispenser, like I did, in order really wow your friends! Now that you have all your fruit read to go, it’s time to talk wine. Just like in my red sangria, I only use bottles of wine that I would drink on their own. That being said, I do tend to stick with sweeter wines such as moscato which I don’t necessarily drink on a regular basis. 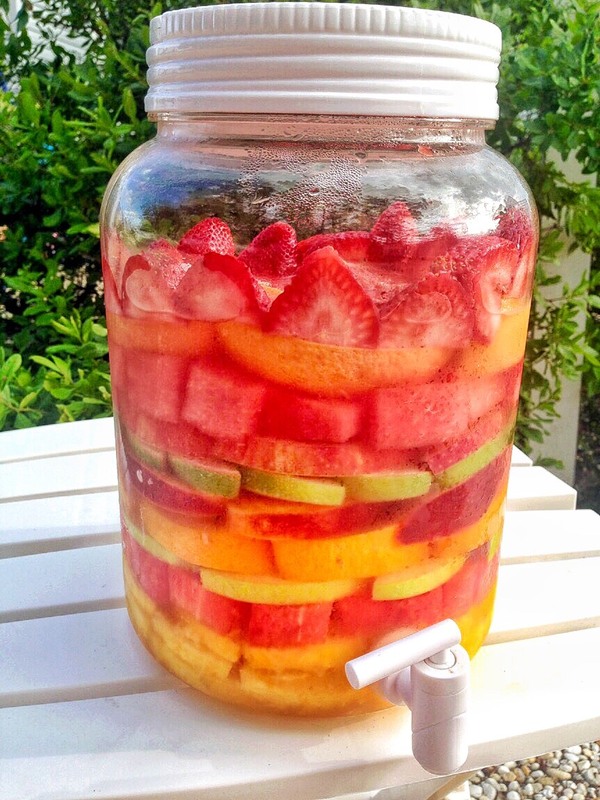 Pour your wine over your fruit and let it sit overnight so that the wine is really infused with the fruit flavors. The next day, all that’s left to do is add the sparkling wine. I typically use a sparkling moscato such as Barefoot Moscato Spumante. If you prefer your sangria a little less sweet you can substitute the non-sparkling moscato for a white blend such as Apothic White or Ménage à Trois White and/or the sparkling moscato for prosecco or champagne.